Thank you for all your input on this post. I love hearing people's thoughts on worship. This guy posted a great blog a few days ago. Good stuff!! Go read my husband's thoughts on it as well. I think he's pretty great. 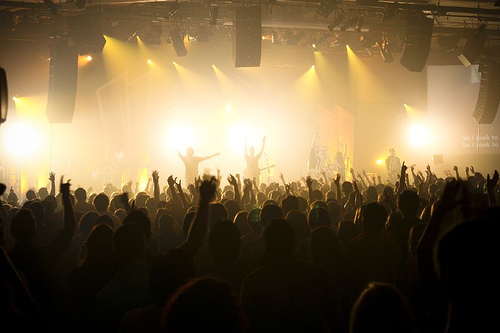 A Worship Leader needs to believe in what they're doing. If it's obvious the leader doesn't believe it, or isn't into it...no one else will be. Then it turns into a bunch of people just singing together. And that's weird. Purpose and Passion. As a Worship Leader, do you have a purpose? Are you getting up on stage every Sunday because it pays the bills? If so, stop. Go get a job at Starbucks. You can't lead people without a purpose and a passion for it. A consistent heart. On and off stage. Talk to the people, believe me...they want to talk to you. I've seen this first hand. I've seen people hang around the back of the church waiting for the worship pastor to come out just to be close to them. Be kind, reach out and love poeple. To quote the very wise Scott Rodgers.tv: If you’re just ’singing in church’, maybe it’s time to connect His story with your story. It’s time to express your response to what He’s done and is doing in your life. Maybe it’s time to stop singing and start worshipping. Get out there. Worship with everything in you! charlie & phil in the OC!